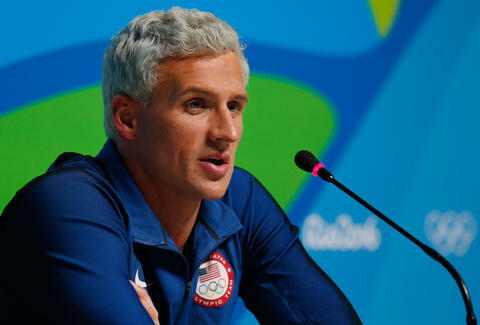 U.S. Olympic swimmer Ryan Lochte and three others members of the U.S. Olympic Swim Team were allegedly robbed at gunpoint in Rio early Sunday morning. According to reports, Lochte, Gunnar Bentz, Jack Conger, and Jimmy Feigen were in a taxi, headed back to the Olympic Village from a party at the French Olympic team's hospitality house when the taxi was pulled over. People posing as "armed police officers" instructed all four of them to get out of the car and get on the ground. Lochte says he refused because they "didn't do anything wrong." Then one of the robbers put a gun to Lochte's head. "He cocked it, put it to my forehead and he said, 'Get down,' and I put my hands up. I was like 'whatever.' He took our money, he took my wallet—he left my cell phone, he left my credentials," Lochte told NBC. None of the four athletes were physically harmed. One of the more mysterious aspects of the story is how it was handled by the IOC, who initially denied that a robbery had taken place. They released a statement Sunday saying that the reports were "absolutely not true," and that they had talked to Lochte and the USOC. After Lochte had gone public with the story, the IOC admitted that a robbery had taken place. Their earlier statement, where they claimed to have talked to Lochte, would appear to be false or something else strange is taking place behind the scenes. While what happened in that communication breakdown isn't clear, it's obvious this kind of press isn't optimal for the IOC. Especially when it concerns a major athlete. There have been a lot of wonderful, heart-warming stories to come out of the Rio Olympics, but there's no denying a vast number of problems as well, with the opulent event taking place right next to some of the country's most impoverished neighborhoods. An Olympic officer was shot and died. Three Swedish tourists were kidnapped. A media bus was attacked. Stray bullets punctured a tent where a press conference was taking place. The robbery happening to an athlete of Lochte's stature only serves to highlight the more troubling side of what is taking place in Rio. It helps shine a spotlight on the wealth gap, the displacement, the political corruption, and other issues that are unavoidable topics in the broader picture of this summer's Olympic Games. Lochte will appear on The Today Show Monday to talk about what happened. Just like the actual Olympics on NBC, the news will be aired a day later on tape delay. The situation took a strange turn Wednesday when a Brazilian judge ordered Ryan Lochte and Jimmy Feigen to surrender their passports and stay in the country due to inconsistencies in their testimony, according to multiple reports. The judge wrote that the police need more time to determine if the swimmers had filed a false police report. Among the reported inconsistencies are Images from the club the swimmers were at conflicting with the timeline they gave police. Additionally, The Daily Mail released Olympic Village surveillance footage that allegedly shows the athletes returning from the incident, joking around. "Local police arrived at the Olympic Village this a.m. and asked to meet with Ryan Lochte and James Feigen and collect their passports in order to secure further testimony from the athletes," said Patrick Sandusky, Chief External Affairs Officer, United States Olympic Committee in a statement. "The swim team moved out of the village after their competition ended, so we were not able to make the athletes available. Additionally, as part of our standard security protocol, we do not make athlete travel plans public and therefore cannot confirm the athletes’ current location." At that point, Lochte had already returned to the United States. NBC reports that Feigen is still in Rio, but there are no reports available as to his whereabouts. Sandusky told the USA Today, "There was no effort to detain anyone." More: Gunnar Bentz & Jack Conger were not named by Brazilian judge who wanted Lochte & Feigen's passports seized but now they are in limbo. That was probably already enough of a twist to leave Law and Order staff writers saying that they wish they had thought of this themselves. But Wednesday night, Bentz and Conger were detained at the airport after they had already made it through customs. They were not named in the original request to hold the passports of Feigen and Lochte. "We can confirm that Jack Conger and Gunnar Bentz were removed from their flight to the United States by Brazilian authorities," a spokesman for the United States Olympic Committee told the New York Times. "We are gathering further information." Shortly after Conger and Bentz were detained,The Today Show's Matt Lauer reported that he had just spoken to Lochte, who says his return flight was his prescheduled flight. Lochte maintained that the story he told was accurate. "He stuck to most of the story," Lauer continued. "He did change one thing. I would say he softened some things, or stepped back. One thing he did not say this time. He didn’t say he was pulled over by these people pretending to be police. "They had gone to the bathroom in a gas station. They got back to the taxi and when they told the taxi driver to ‘go,’ he didn’t move. They said ‘let’s go again, we have got to get out of here’ and again the taxi driver didn’t move. And that is when he says two men approached the car with guns and badges." Lochte also said that the gun wasn't held to his head. The alleged assailant "pointed the gun in [his] direction," according to Lauer's report. But he maintains that the rest of the story is as they told it initially. None of the other swimmers talked to the media Wednesday.